A large gauge swatch is important: I suggest 100 sts by 100 rows. For a bolero style garment with a “shawl” collar, a place to start is with bottom and top sections measuring at least 6 inches in height, and for the middle rectangle to measure 22in W by 23in L. Again, a muslin in a purchased knit of the center section will help decide how much of it needs to be seamed to allow for an armhole opening, keeping in mind that the opening in the machine knit may have less stretch than the test muslin knit. 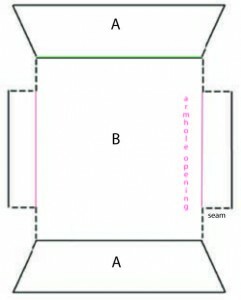 The number of stitches cast on are based on those required for section B, with adjustments made to allow for lining up pattern repeats in seaming up the finished piece. Beginning the knit with a cast on that allows for maximum stretch, test out rib pattern (A), transfer to mostly single bed for (B), bind off and treat the swatch in the same way the finished garment will be: ie. steam, wash, etc. Testing the stretch in the cast on edge and its immediate fabric neighbor will define how the large a “shawl collar”may be achieved. A more “circular” shape when worn may be obtained by adjusting height while keeping in mind that a true circle would have a circumference approximately 3 times its diameter which in this test would be based on the stitch count obtained in knitting the width of the swatch in the B pattern. 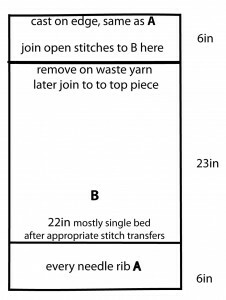 If a significantly larger “donut” is required in the design, the every needle rib can be ended in a row of stocking stitch after transferring stitches to main knitting bed, taken off machine, and rehung on fewer stitches prior to knitting B. Same step is taken when joining last section. Trial basting side seams will insure armhole fitting comfortably. If more of a cap sleeve is desired, stitches may be added in location of armholes during knitting B, or bands may be knit onto or stitched onto armhole after completion of piece. Suggestions for cast on will follow.